$3.00 for a freakin' donut? Say what? Are you kidding me? What's next, a Chinese "yau ja gwai" for $5.00??? Hey, we can like have different flavours of yau ja gwai! Like one with a passion fruit glaze... or maybe not... Anyways, when I found out about Cartems Donuterie was charging $15.00 for half-a-dozen donuts (yes, that is half-a-dozen and $30.00 for a full dozen), I almost lost my appetite. Well, not really, I never lose my appetite... Ultimately, I put it on the back burner due to my unwillingness to pay that much for fried dough. Well, I gave in. People were just saying too many good things about it. 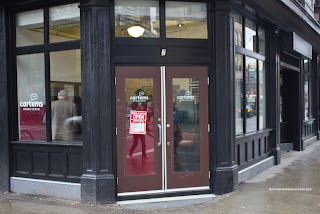 I broke down and headed over to the corner of Hastings and Carrall for some gourmet donuts. Hastings and Carrall??? Like kitty-corner to Pigeon Park? Yup, that is right. These better be damn good donuts. As I was getting out of my car, I noticed a well-dressed, mature gentleman with box of donuts in hand getting into his Bentley. 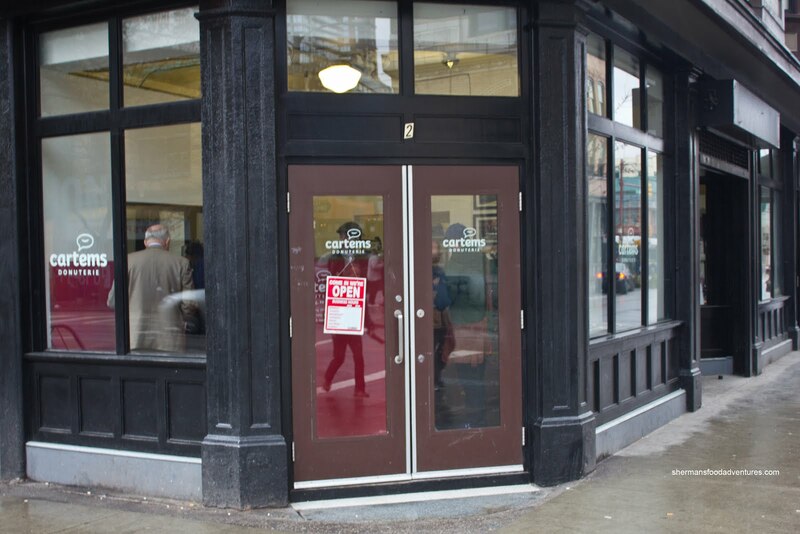 Wow, these donuts must be good for a dude in a Bentley to venture into the Downtown Eastside. As I was getting my order, the sights and sounds of the neighbourhood could not be mistakened. The constant yelling from some random lady was deafening. The fact I was buying $3.00 donuts when there were people outside who wouldn't even fathom having that much in spare change was paradoxical. Made me want to head back to the Salvation Army Habourlight a few blocks down. However, that is another story for another post. Back to the donuts... I got a half-dozen consisting of a few different choices. I tried the Classic with vanilla bean glaze to start as a baseline of sorts. Instantly, I could tell why these donuts are so expensive. The texture was consistent and appealing. 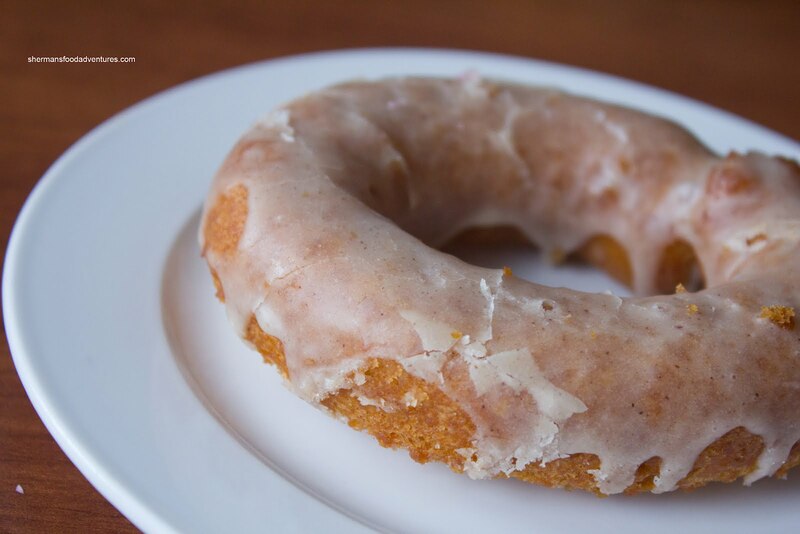 From the crisp exterior all the way into the moist semi-sweet interior, this felt like a special donut. However, the glaze was still quite sweet which was tempered somewhat by its conservative deployment. Only one side of the donut got the glaze treatment. Of course I had to get their very popular Maple Bourbon which is a version of the "bacon + donut" craze started by Voodoo Donut in Portland. Unlike the maple bacon bar, the one here is a cake donut with a maple bourbon glaze and only intermittent sprinkles of crispy bacon. Hence, the bacon-ness was somewhat muted, yet at the same time complimented the heavier cake donut since a whole slice of bacon would've been overkill. 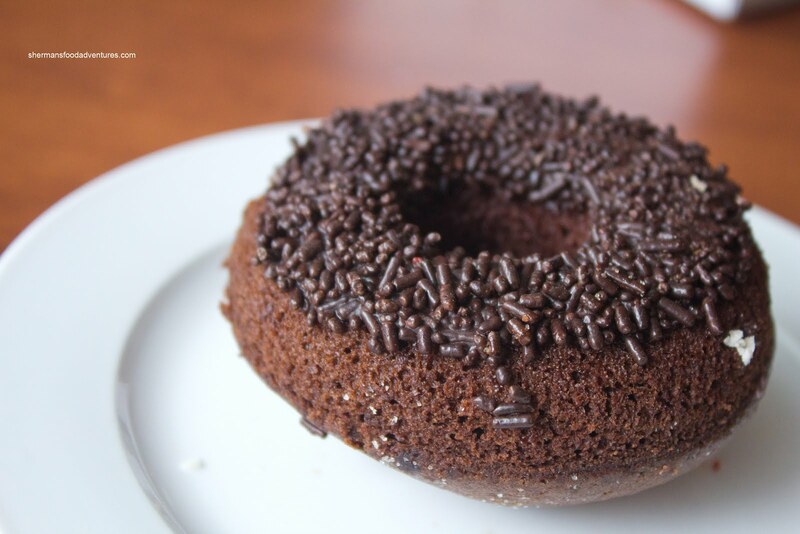 A different donut of sorts was the Vegan Chocolate which was tagged as "no animals in here" donut. 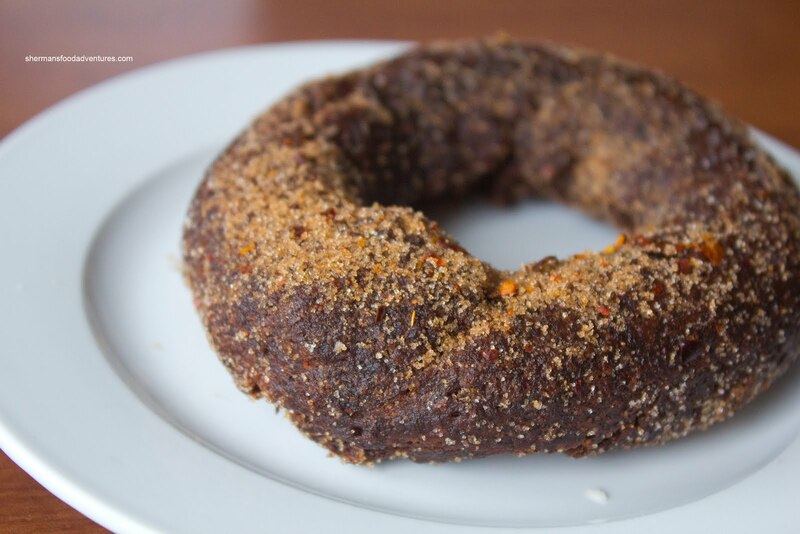 With texture similar to a bundt cake, this moist "donut" (which was more like a piece of moist chocolate cake) had a rich flavour. It was not overly sweet, rather it oozed chocolateness with depth. I was surprised at the moistness and real chocolate flavour. 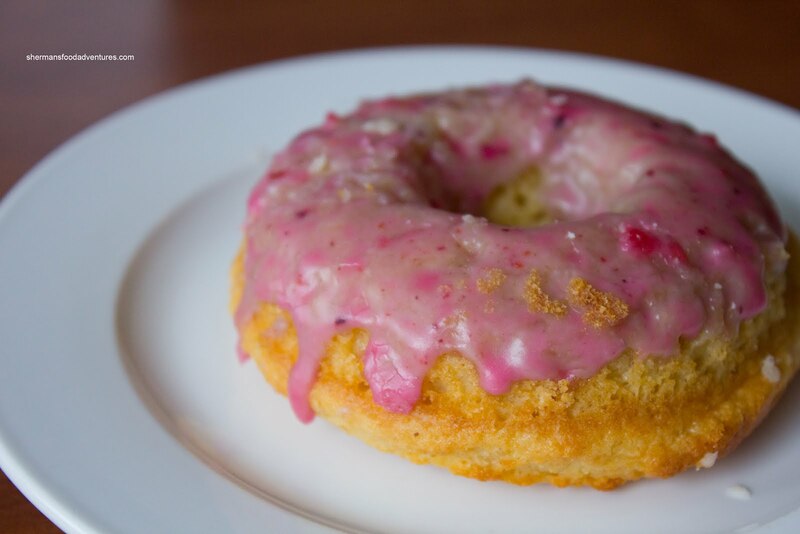 A similar donut in terms of texture was a gluten-free donut - the Berry Tea (thanks to Sean for GF info). Again, it resembled a bundt cake yet more moist. It was mild in flavour and there was just enough glaze for flavour. I could pick out the fruit from the sugar which is not always the case with many of donuts. Also, it was good on its own despite being gluten-free. 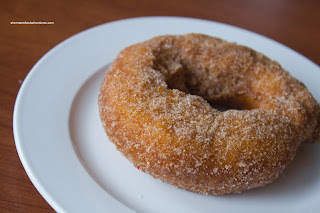 The one donut which really illustrated the beautiful textures was the Cinnamon & Sugar. Since there was no glaze or anything to compromise the fried dough, there was an appealing crunch that gave way to the soft cake interior. Once again, there was just enough sugar on the outside for taste, but it was not overwhelming. My son said it best as he thought the crunch made the donut resemble a churro. Now for my favourite of the whole lot - the Sweet Heat. Essentially a chocolate donut with a light sprinkle of sugar along with chili flakes, this had it all. The rich chocolate cake was moist and reserved in sweetness. There was only a light amount of spice combined with the mild sugar hit. I could've eaten many more of these and I would pay the money to buy them. Am I crazy? Well, maybe. But believe me, these donuts are legit. You won't confuse them with Tim Horton's or Duffin's. It is all about how you approach it. Think of them as "pastries" rather than donuts and it'll seem more reasonable. For myself, I'll gladly eat my words and the donuts as well. Just so happens I finally made it down there yesterday. It was just after 1pm and they still had quite a few types, save the Triple Chocolate Threat. Oh well, can’t win ‘em all. So I got the cinnamon sugar and the maple bacon bourbon. Cinnamon sugar was melt-in-your-mouth, so much so that after a few “inhales” it was gone like vaporware. If I could nit-pick, a bit more cinnamon flavour would be nice, but otherwise it rocked. I give it 9/10. 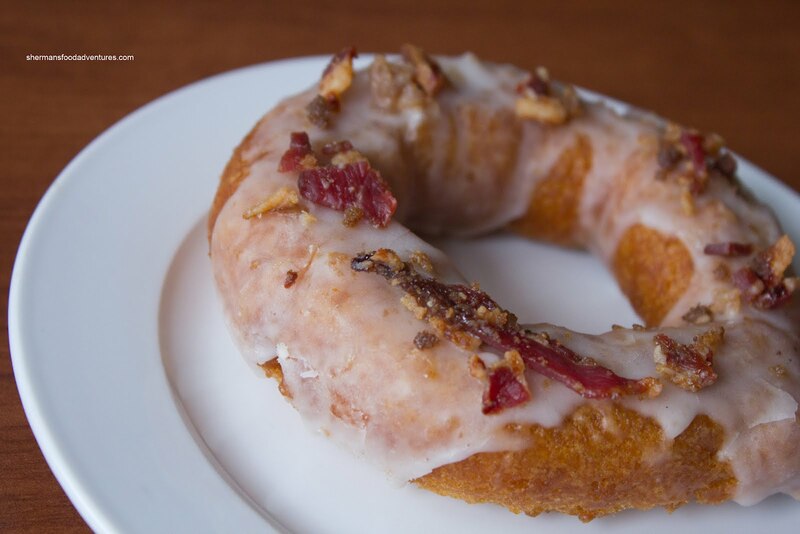 The maple bacon bourbon was HIGHLY anticipated, as I wanted to compare it to Rocket Donut’s version. And perhaps that was why I felt a bit disappointed. It was too sweet for my taste, the dough was a bit “moist” in the middle, and the bacon bits ….. not enough and overpowered by the maple bourbon glaze. Also the bacon bits themselves tasted sweet, as if they’ve been candied or something. I was merely hoping for a salty, strong-smoked flavour to juxtapose the rest of the donut. So in that respect, I’d rate the MBB I got a 6/10. If you want a really good, old fashioned type donut without all the fancy toppings and flavours, you HAVE to check out Doris Jean's Bakery. Hmm, Doris Jean looks great. In Lynden ...... I'm there ! Thx Brad.